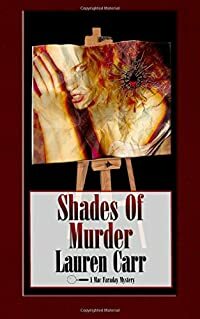 Shades of Murder by Lauren Carr: Synopsis and Online Purchase Options. Synopsis (from the publisher): Question: What do you get the man with everything? Answer: When that man is the heir of the late mystery writer Robin Spencer, retired homicide detective Mac Faraday, you get him cold case to solve. This time it is a piece of art. But this isn't just any work of art—it's a stolen masterpiece with a murder attached to it. Ilysa Ramsay was in the midst of taking the art world by storm with her artistic genius. Hours after unveiling her latest masterpiece—she is found dead in her Deep Creek Lake studio—and her painting is nowhere to be found. Almost a decade later, the long lost Ilysa Ramsay masterpiece has found its way into Mac Faraday's hands and he can't resist the urge to delve into the case. A world away, in Pittsburgh, Pennsylvania; former JAG lawyer Joshua Thornton agrees to do a favor for the last person he would ever expect to do a favor—a convicted serial killer. The Favor: Solve the one murder wrongly attributed to him. Joshua finds an unexpected ally in Cameron Gates, a spunky detective who has reason to believe the young woman known to the media only as Jane Doe, Victim Number Four, was the victim of a copycat. Together, Joshua and Cameron set out to light a flame under the cold case only to find that someone behind the scenes wants the case to remain cold, and is willing to kill to keep it that way. Little do these detectives know that the paths of their respective cases are on a collision course when they follow the clues to bring them together in a showdown with a killer who's got a talent for murder!